If you’ve ever been injured and couldn’t do the things you love, you know that it can it is not an easy adjustment. Often times, recovering from an injury can take as much a toll on your emotional and mental health as it does on your physical health. I used to consider myself a runner, and like all runners, I like to push myself; farther, faster, you get the hint. One day I ran 6 miles and my time was a personal best. I noticed that my right hip was hurting afterwards, so I gave it a few days rest and tried to run again. Each time I ran, the distance would go down and my time would go up. I was getting slower and the pain was getting worse, until the point where I would try to take one running stride and feel sharp intense pain in my hip. It turns out that I had muscle fraying and cartilage damage. My runs were now replaced with physical therapy, and I was miserable. I was young and naive, and I ignored everything my body was trying to tell me. I was convinced that I would never be able to run again, and that no other workout out there would give me the same high as running did. Others around me started to notice how unhappy I was. Around this same time, I began to date my now husband and he taught me to love weightlifting and other types of cardio. This new exercise regimen taught me to respect my body, listen to it, and be appreciate how strong my body actually was. I learned that I didn’t have to give up my athletic identify, but I could embrace a whole new view on exercise and my body. Don’t let go of your athletic identity—show up to sporting events to supports others if you can’t participate. 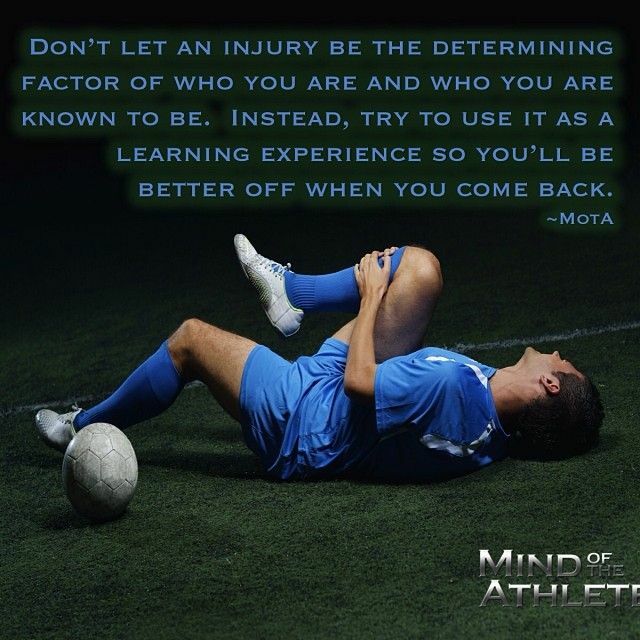 Don’t let your injury stand in the way of still being a part of the athletic and active community. Be open to new experiences—I had to learn to find a new way of exercising, and in order to do that, I had to be open to trying new things! Try to focus on happiness and joy, over the pain—keeping a gratitude journal is great for this. Also, engaging in more meaningful activities can help keep you focused on positive things in your life. Strive to keep a daily active routine—even if it is just being on a stationary bike, low impact exercises, or stretching, any physical activity is important to keeping your routine. Focus on moving forward and growing—put some focus on growing as a whole person and not just an athlete.